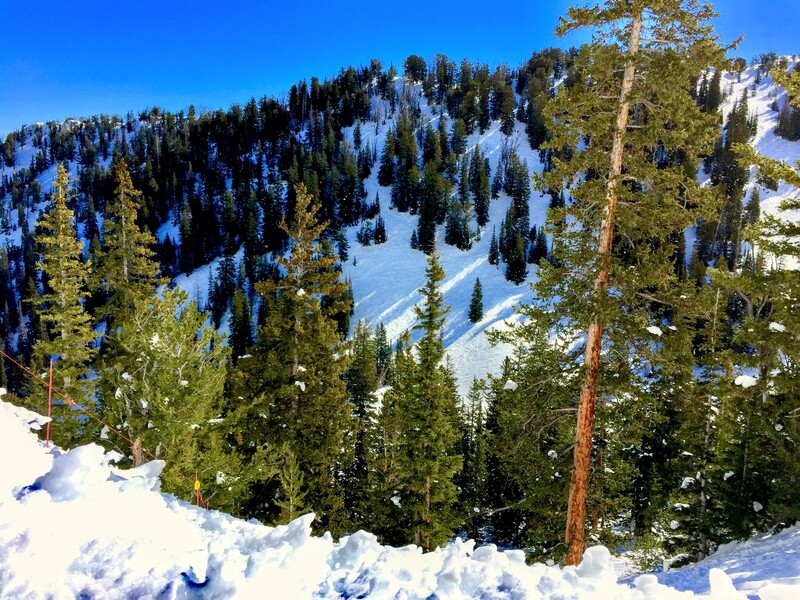 TLDR: Spring is here, but the powder won’t run dry for a while. Two storms will bring moderate precipitation over northern UT resorts and substantial snowfall to southern UT resorts. Scroll down for a summarized snowfall forecast. I headed up-canyon this morning and eventually stumbled through a few substantial corn stashes. Spring has arrived. Of course, we’re also under a particular weather feature that keeps the sun out over the slopes. Combined with the high spring sun, that will keep even the somewhat north-facing snowpack in a melt-freeze diurnal cycle. This weather feature consists of a stretching deformation in the wind flow above Utah. To explain, deformation describes how objects would be affected by the flow in some large area. In this stretching deformation, an object like random cloudiness would be stretched apart by the wind flow before it could organize and establish itself. The result: blue skies, calm weather, lots of sunshine. By the grace of high elevation, we’d expect the snow potential at most resorts to continue late into spring. 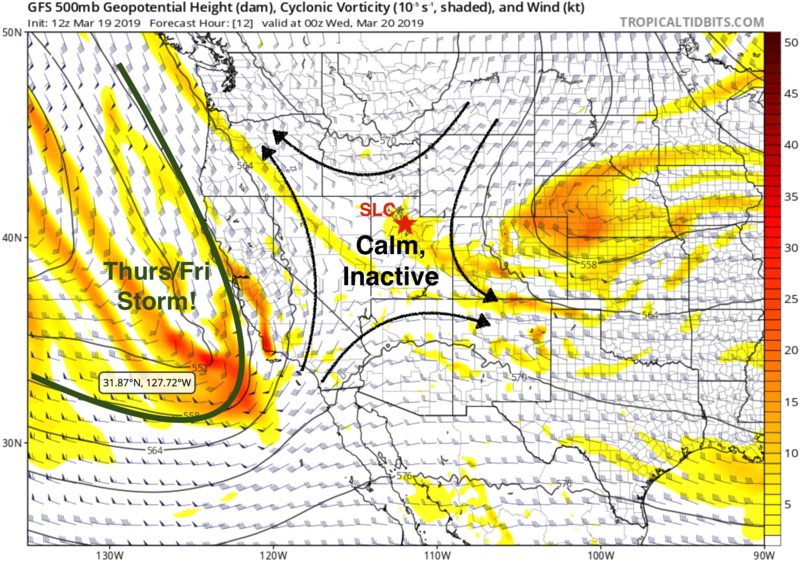 In fact, we’ve been hinting toward at least two storms to hit parts of Utah in other posts. Overall, we seem to remain moderately active in the foreseeable future, which will also contain a few inactive periods similar to this week. With that, I’m now going to focus in on two back-to-back storms that will impact the area between Wednesday and Sunday nights. Temperatures this week are just about average for this time of year across the western US. This means that snow levels are on average up to middle- and upper-elevations in the Wasatch, upper-elevations in Southern Utah. Therefore, you can expect that lower parts of lower-elevation resorts won’t see much snow this week. First, a late-week system will hit hard over southern portions of the western US, putting resorts like Brian Head and Eagle Point in the position to receive over a foot of snow. Northern resorts will catch the periphery of this storm and receive moderate snowfall by Friday evening. I summarize these in the graph below. Note: We’re working on interpolating downscaling model forecasts to Brian Head and Eagle Point resorts, so I did not include confidence intervals for snowfall at those locations. However, those skiers can expect about 1.5″ of snow-water equivalent, give or take, and with maybe an average of 11 snow-liquid ratio, I’d say 12-18″ is a good snowfall forecast for this storm. 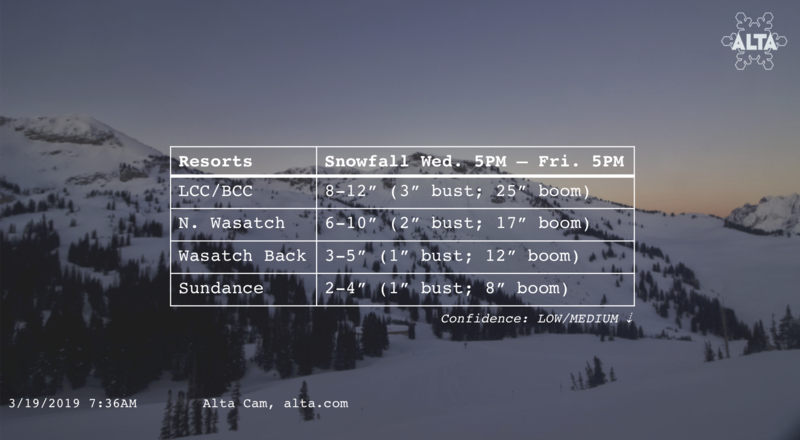 Subjective snowfall forecast for Utah resorts thru 5 PM MT Friday 3/22/2019. These are primarily from both GEFS and CMCE members of the NAEFS. A second system will track farther north and will be weaker than the first. Temperatures should be similarly on-average for this time of year, but this storm is a bit more complex and uncertain than the last. Therefore, I’m unable to provide a forecast that I’m confident will be accurate. For fun, my initial educated guess would be 1-3″ at lower-elevations and 3-6″ at higher elevations*. Perhaps more locally. Check back tomorrow for final comments on the storm 1 forecast, then later for details about storm 2. This should be a fun weekend for skiers.